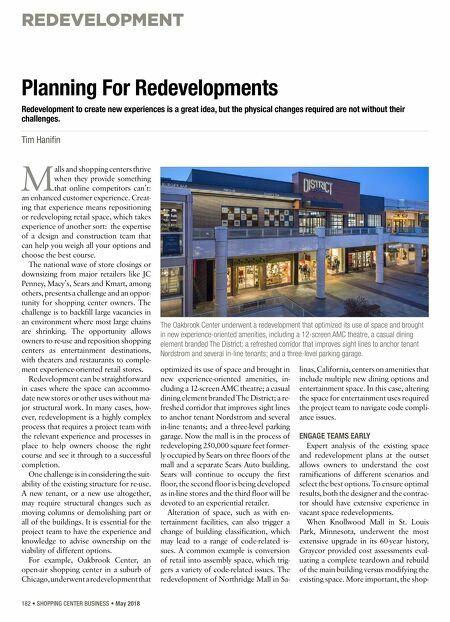 REDEVELOPMENT 182 • SHOPPING CENTER BUSINESS • May 2018 M alls and shopping centers thrive when they provide something that online competitors can't: an enhanced customer experience. Creat- ing that experience means repositioning or redeveloping retail space, which takes experience of another sort: the expertise of a design and construction team that can help you weigh all your options and choose the best course. The national wave of store closings or downsizing from major retailers like JC Penney, Macy's, Sears and Kmart, among others, presents a challenge and an oppor- tunity for shopping center owners. The challenge is to backfill large vacancies in an environment where most large chains are shrinking. The opportunity allows owners to re-use and reposition shopping centers as entertainment destinations, with theaters and restaurants to comple- ment experience-oriented retail stores. Redevelopment can be straightforward in cases where the space can accommo- date new stores or other uses without ma- jor structural work. In many cases, how- ever, redevelopment is a highly complex process that requires a project team with the relevant experience and processes in place to help owners choose the right course and see it through to a successful completion. One challenge is in considering the suit- ability of the existing structure for re-use. A new tenant, or a new use altogether, may require structural changes such as moving columns or demolishing part or all of the buildings. It is essential for the project team to have the experience and knowledge to advise ownership on the viability of different options. 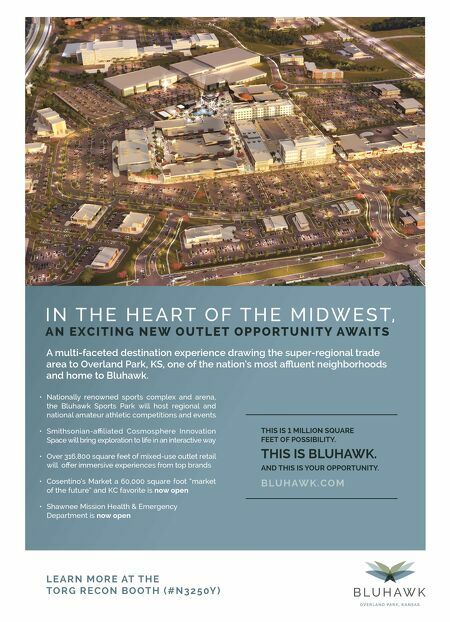 For example, Oakbrook Center, an open-air shopping center in a suburb of Chicago, underwent a redevelopment that optimized its use of space and brought in new experience-oriented amenities, in- cluding a 12-screen AMC theatre; a casual dining element branded The District; a re- freshed corridor that improves sight lines to anchor tenant Nordstrom and several in-line tenants; and a three-level parking garage. Now the mall is in the process of redeveloping 250,000 square feet former- ly occupied by Sears on three floors of the mall and a separate Sears Auto building. Sears will continue to occupy the first floor, the second floor is being developed as in-line stores and the third floor will be devoted to an experiential retailer. Alteration of space, such as with en- tertainment facilities, can also trigger a change of building classification, which may lead to a range of code-related is- sues. A common example is conversion of retail into assembly space, which trig- gers a variety of code-related issues. The redevelopment of Northridge Mall in Sa- linas, California, centers on amenities that include multiple new dining options and entertainment space. In this case, altering the space for entertainment uses required the project team to navigate code compli- ance issues. ENGAGE TEAMS EARLY Expert analysis of the existing space and redevelopment plans at the outset allows owners to understand the cost ramifications of different scenarios and select the best options. To ensure optimal results, both the designer and the contrac- tor should have extensive experience in vacant space redevelopments. When Knollwood Mall in St. Louis Park, Minnesota, underwent the most extensive upgrade in its 60-year history, Graycor provided cost assessments eval- uating a complete teardown and rebuild of the main building versus modifying the existing space. More important, the shop- Planning For Redevelopments Redevelopment to create new experiences is a great idea, but the physical changes required are not without their challenges. Tim Hanifin The Oakbrook Center underwent a redevelopment that optimized its use of space and brought in new experience-oriented amenities, including a 12-screen AMC theatre, a casual dining element branded The District; a refreshed corridor that improves sight lines to anchor tenant Nordstrom and several in-line tenants; and a three-level parking garage.